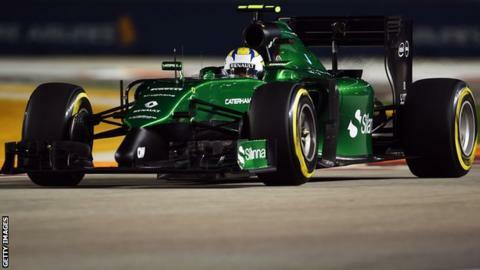 The Caterham team say they will race at the Japanese Grand Prix this weekend despite bailiffs visiting their base. Items including a 2013 F1 test car, F1 car parts due for this weekend in Japan, F1 steering wheels and F1 wheels with tyres were seized by the bailiffs. However, a Caterham statement said: "All operations are currently in place at Leafield and the race team is doing its preparation in Japan." The bailiffs' action was taken against Caterham Sports Limited. A spokeswoman for the Sheriffs Office added that three writs of control had been enforced and that the goods taken would be returned "if the judgment debt is paid in full before the goods are sold". The Sheriffs Office earlier announced that items "seized and removed from a Formula 1 team" would be auctioned off later this month. Caterham said in a statement that the bailiffs' action concerns a supplier to parent company 1MRT and denied "uncontrolled rumours" that the team's involvement in Formula 1 would be affected. "This company is not owned by 1MRT and it has no influence over the entry of Caterham F1 or the entrant," the statement added. Caterham's owners formed a new company registered to the Leafield site, Caterham CF1 Grand Prix Ltd, in August. The team, which have not scored a point in almost four full seasons on the grid, changed ownership in July when it was sold by Malaysian entrepreneur Tony Fernandes to a consortium of Swiss and Middle Eastern investors, leading to more than 40 job losses. Their Leafield factory previously housed Super Aguri and Arrows, two former F1 teams who were forced to quit the sport because of financial problems.